Leadership and Management for Nurses: Core Competencies for Quality Care is designed for all courses in leadership or management in nursing. It also serves as a refresher for topics and issues previously covered in nursing school, while also addressing issues that nurses will face in their new professional practice. This book is an excellent resource for professionals in the nursing field and is also a perfect fit for an RN-to-BSN Leadership and Management course. 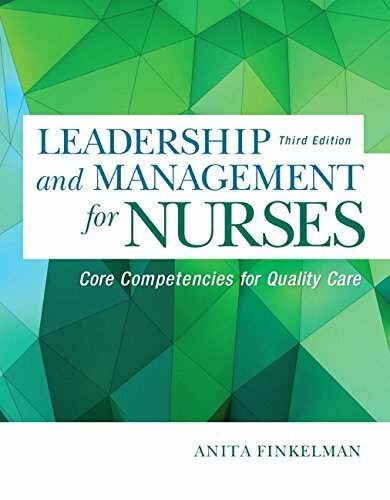 Leadership and Management for Nurses offers a current perspective on leadership and management in nursing, and gives nurses a thorough understanding of what it takes to lead in delivering quality health care. Reflecting the Institute of Medicine’s influential framework, the book emphasizes five core competencies: providing patient-centered care; working in interdisciplinary teams; employing evidence-based practice; applying quality improvement; and utilizing informatics. Two entirely new chapters examine critical issues in healthcare delivery today. Expanded end-of-chapter Applying Leadership and Management features encourage students to think like nurses as they hone their clinical-reasoning skills, apply competencies, and engage with the content.